Villa Braos is a single holiday home at the south side of Crete, ideally suited for relaxing holidays as close to the sea as to the mountains. Get spoiled by lonely beaches, tasty food and remarkable nature, discover the clear beauty of Cretes countryside. 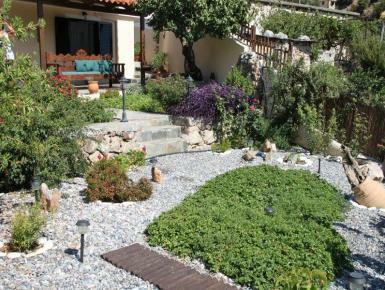 The house is located at the edge of the village of Rodakino with view along the valley to the sea. Rodakino is the greek word for peach, the name is said to be inspired by the backing mountains shape. The village at Cretes south coast is a rather quiet place even during main season. There is a super market, a kafeneion, a hotel bar, some pensions and a lot of nature. The nearby village of Plakias, in contrast, offers everything Rodakino doesnt: bars, more tavernas, rent cars, shops, doctor and pharmacy. The usual civilisation isnt far away, just in case.